Newly Discovered Exoplanet Provides Glimpse Into Jupiter's Past : The Two-Way Scientists using the ground-based Gemini Planet Imager found a very young "Super Jupiter" about 100 light years away. 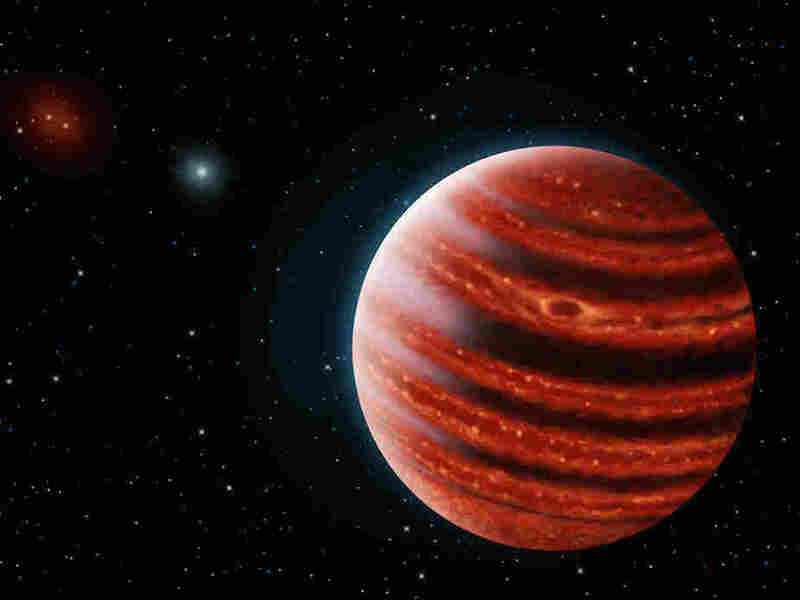 An artistic conception of the Jupiter-like exoplanet, 51 Eridani b, seen in the near-infrared light that shows the hot layers deep in its atmosphere glowing through clouds. The discovery of a new planet about 100 light years from Earth could provide clues as to what Jupiter was like early in the life of our solar system. The new exoplanet, 51 Eridani b, is thought to be just 20 million years old, a tiny fraction of the age of Jupiter, which was formed along with the rest of the solar system about 4.5 billion years ago. The newly discovered planet, the first to be imaged by Gemini Planet Imager (GPI), a ground-based telescope installed on the 8-meter Gemini South Telescope in Chile, bears a striking resemblance to a young Jupiter, with a mass about twice that of our solar system's largest planet. Space.com calls 51 Eridani b "perhaps the coldest and smallest exoplanet ever to be directly imaged. What's more, it bears the strongest exoplanetary signatures so far of the gas methane, which is prominent in Jupiter's atmosphere." It orbits its star a bit farther than Saturn orbits ours. "Finding these exoplanets is difficult," study co-author Rahul I. Patel tells The Washington Post. "You're basically looking for a firefly that's really close to a flood lamp, standing about a mile away and looking through a glass of water." GPI "was specifically designed to spot fledgling exoplanets by separating their faint light from the overwhelming glare of their host stars, thus offering a revealing look back into the early, murky eras of planetary formation," Space.com says. Unlike the space-bound Kepler Space Telescope, which has been in service since 2009 and has discovered an astounding 1,000+ exoplanets by "seeing their shadow," the Gemini Planet Imager instead "sees their glow, which we refer to as direct imaging," Bruce Macintosh, a professor of physics at Kavli Institute of Particle Physics who heads the GPI team, said in a statement released by Stanford University. Stanford explains: "The astronomers use adaptive optics to sharpen the image of a star, and then block out the starlight. Any remaining incoming light is then analyzed, with the brightest spots indicating a possible planet."